The two exposés posted below in their entirety provide essential material regarding the true origin of the House of Saud, as well as vital background about the current monarchy ruling Saudi Arabia. The photo above includes Chaim Weizmann, a zealous Zionist leader who was perhaps the first Israeli politician to actively promote the Greater Israel project. Only when the once highly concealed content of these articles is correctly understood can the intractable challenges throughout the Middle East be met with any degree of success. The report relies heavily on the Memoirs of Mr. Hempher, which describe in detail how a British spy to the Middle East, in the middle of the eighteenth century, made contact with Adbul Wahhab, to create a subversive version of Islam, the notorious sect of Wahhabism, which became the founding cult of the Saudi regime. The movement was temporarily suppressed by the Ottomam armies in the middle of the nineteenth century. But with the assistance of the British, the Wahhabis and their Saudi sponsors returned to power and founded their own state in 1932. Since then, the Saudis have collaborated closely with the Americans, to whom they owe their tremendous oil wealth, in funding various Islamic fundamentalist organizations and other American covert operations, particularly the “jihad” in Afghanistan. But the Saudis simultaneously use the immense wealth at their disposal to disseminate this disruptive brand of Islam to various parts of the world, categorized by some of the largest propaganda campaign in history. However, while the Memoirs only emerged in the 1970s, Pasha wrote his version of the story already in 1888. Ayyub Sabri Pasha was a well-known Ottoman writer and Turkish naval admiral, who served the Ottoman army in the Arabian Peninsula, writing several works about the region and its history. Including The Beginning and Spreading of Wahhabism, where he recounts Abdul Wahhab’s association and plotting with Hempher. Additionally, Abdul Wahhab was descended from Wahib Al-Tamimi, so, as reported by al Said Nasir, in The History of the Saud Family, the Saudi ambassador in Cairo, Abdullah bin Ibrahim al Mufaddal, paid Muhammad Al-Tamimi thirty-five thousand Jinee in the year 1943, to forge a family tree of the Saudi family and that of Abdul Wahhab, and merge them into one, claiming their origin from the Prophet Mohammed. So that (concealed) Jew reached NAJD with the caravan. In NAJD, he started to promulgate a lot of propaganda for himself through his companions (his alleged cousins), a fact, which gathered around him a considerable number of new supporters; but, unexpectedly, he confronted a campaign of opposition to his views led by SHEIKH SALEH SALMAN ABDULLA AL TAMIMI, who was a Muslem religious preacher in AL-QASEEM. The radius of his preaching area included Najd, Yemen, and Hijaz, a fact which compelled the Jew (the Ancestor of the present SAUDI FAMILY to depart from AL QASEEM to AL IHSA, where he changed his name (MORDAKHAI) To MARKHAN BIN IBRAHIM MUSA. Then he changed the location of his residence and settled at a place called DIR’IYA near AL-QATEEF, where he started to spread among the inhabitants a fabricated story about the shield of our Prophet MOHAMMAD (p.b.u.h), that it was taken as a booty by an Arab Pagan in consequence of OHOD Battle between the Arab pagans and the Muslims. “That shield, he said, was sold by the Arab Pagan to a Jewish Clan called BANU QUNAIQA’ who preserved it as a treasure! 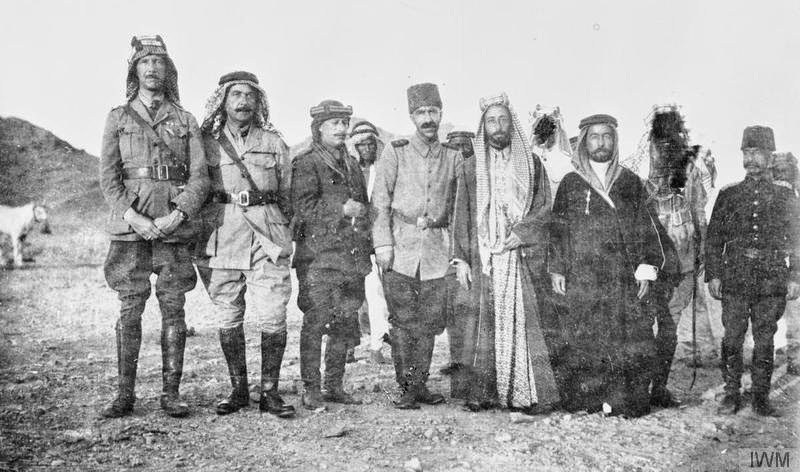 He gradually enhanced his position among the Bedouins through such stories which indicated how the Jewish clans in Arabia were so influential and deserved high esteem. He gained some personal importance among the Bedouins, and decided to settle permanently there, at DIR’IYA town, near AL QATEEF, which he decided to be his (Capital) on the Persian Gulf. He aspired to make it his spring-board for establishing a Jewish Kingdom in Arabia. 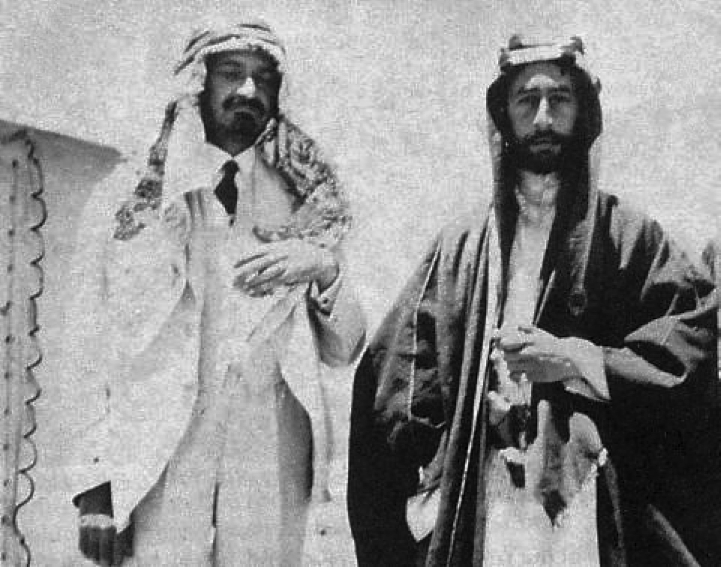 King FAISAL AL-SAUD at that time could not deny his family’s kindred with the JEWS when he declared to the WASHINGTON POST on September 17, 1969 stating: “WE, THE SAUDI FAMILY, are cousins of the Jews: we entirely disagree with any Arab or Muslim [sic] Authority which shows any antagonism to the Jews; but we must live together with them in peace. Our country (ARABIA) is the Fountain head from where the first Jew sprang, and his descendants spread out all over the world.” That was the declaration of KING FAISAL AL-SAUD BIN ABDUL AZIZ!!!!! 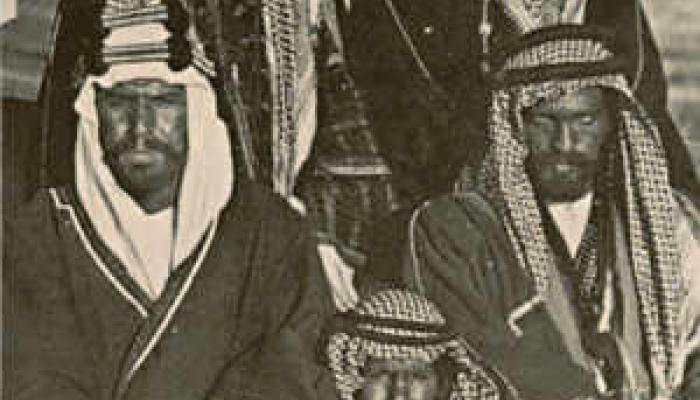 HAFEZ WAHBI, The SAUDI Legal Adviser, mentioned in his book entitled: “THE PENINSULA OF ARABIA” that KING ABDUL AZIZ AL-SAUD, who died in 1953, had said : “Our Message (SAUDI MESSAGE) encountered the opposition of all Arab Tribes; my grandfather, SAUD AWAL, once imprisoned a number of the Sheikhs of MATHEER Tribe; and when another group of the same tribe came to intercede for the release of the prisoners, SAUD AWAL gave orders to his men to cut off the heads of all the prisoners, then, he wanted to humiliate and derogate the interceders by inviting them to eat from a banquet he prepared from the cooked flesh of his victims whose cut off heads he placed on the top of the food platters!! The interceders became so alarmed and declined to eat the flesh of their relatives; and, because of their refusal to eat, he ordered his men to cut off their heads too. That hideous crime was committed by that self-imposed king to innocent people whose guilt was their opposition to his most cruel and extremely despotic rules.